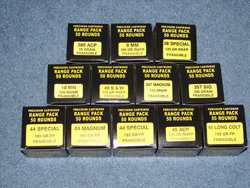 Precision Cartridge, Inc. - Frangible Bullets - Ammunition in 380, 9mm, 38, 357 Mag., 357 Sig., 10mm, 40 S&W, 41, 44, 45. Precision Cartridge, Inc. uses Ervin Industries Frangible Bullets. Steel plate shooting has become an important part of police training and competition shooting. Accidents happen all the time at the ranges because of ricocheting fragments. Frangible lead free bullets are 100% safe when hitting anything as hard, or harder than the bullet. 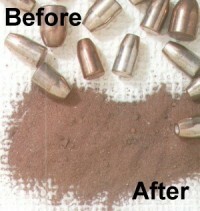 Frangible bullet turns to dust when it hits something hard, and it shoots just as good as plated bullets. There is absolutely no lead! Many police are shooting in steel shoot houses and at steel plates on the range. 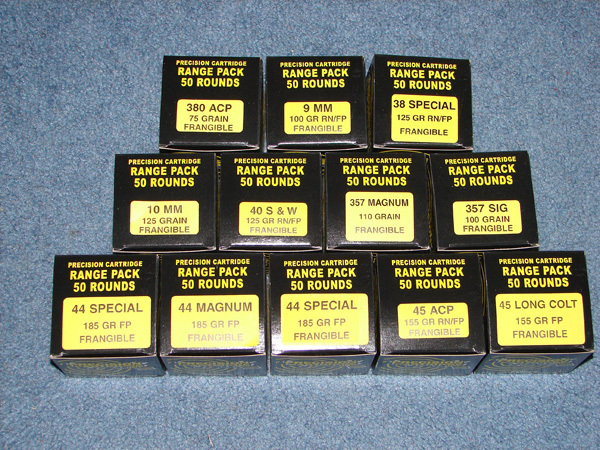 They are allowed to use only a reduced Hazard bullets (less toxic, reduced splash back, and no lead)! Some police ranges are going 100% lead-free, and they will also be free of problems with OSHA and the EPA. Also, thay are eliminating the risk of costly clean-up or shutdown. Frangible Bullets are recommended for shooting houses, steel targets, indoor ranges, outdoor ranges, close combat and general training ammunition. Their minimal splashback, reduced toxicity, and reduced hazard are designed to meet goverment standards. Click here for important information on Lead Exposure Risks in Firing Ranges. Copyright © 1997 - 2018 Dennis G. Fossey. All Rights Reserved.